The Audi A5 is available in three trim options - Sportback, Coupe and Cabriolet and seven power engine options. 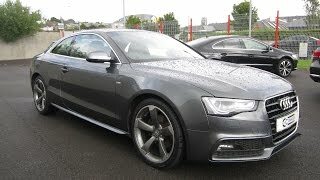 The Audi A5 Coupe 2012 costs about € 34,000 and will be available in the market soon. The presence of A5 models has become even more prominent. The taillights and the headlights have been restyled, on request, Audi xenon plus technology in them, with homogenous LED daytime running lights. The interior colors and materials set new accents, the operation has been refined in many details. The new engine program consists entirely of turbocharged direct injection engines. This applies to the four TDI as well as for the three TFSI petrol engine, under which it presents new 1.8 TFSI several groundbreaking innovations. On average, the consumption of the engines has dropped by eleven percent, the start-stop system and the recovery system for all engine-gearbox versions series. For each engine, optimum power transmission is available - a six-speed manual gearbox, multitronic, seven-speed S tronic, front or quattro drive. On quattro drive train coming, in conjunction with the S tronic, the crown-gear center differential and wheel-selective torque control is used, the sport differential acts as a perfect complement. The chassis has been fine-tuned yet, select the optional Audi drive system and the dynamic steering system further enhance the driving pleasure. New in the A5 family is the electromechanical power steering. The new A5 is a highly intelligent car. His driver assistance systems are developed intensively in the field of infotainment, the Bluetooth car phone available online. It brings a number of special services on board, and links the A5 to the Internet. 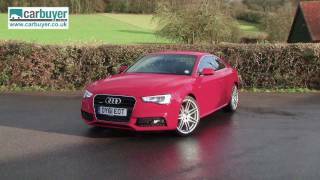 The Audi A5 - a type of success is even more attractive to a successful family is even more attractive: Audi A5 enhances the series. The Sportback, the Coupé, the Cabriolet and S5 models get new solutions that make it even sportier and more efficient - the engines, the quattro drive system and the infotainment. The design is even more dynamic. Ever since its debut fascinate the models of the A5 family - the Sportback, the coupe and convertible - with its elegance. The flowing silhouettes, sharp lines and the powerful surfaces formulate a strong statement. Revaluation gains in product design to new, sharp accents. The single-frame grille, a high-gloss black, has chamfered upper corners, its transverse ribs and the Audi rings seem sculptural. The new front bumper with integrated air inlets pronounced ridges strong, modified fog lights and flat screens. The bonnet looks from sharp plastic edges worked out - the whole front is flatter and wider. Even the headlights have been revised: Your bottom edge forms a wave, its interior is restructured. With the optional xenon plus units is the LED daytime running a small, homogenous clip, which surrounds the headlights. Upon request, Audi can supply the adaptive light with dynamic cornering and curve light. The redesigned rear lights are also present, with optional integrated LED lighting strips. Further details can be found on the bumper. Through the revisions, the outer length grows by an inch each. The A5 Sportback is 4.71 meters long, the coupe and convertible each 4.63 meters.The color palette was reshuffled - it includes 16 colors, the A5 Cabriolet is the fully automatic acoustic hood in four colors. For lovers of a more dynamic look, the S line exterior package is your choice. The bodies convince with high stiffness, sovereign crash safety, high ride comfort and low weight. The front fenders are made of aluminum, which improves the distribution of axle loads. The aerodynamic fine-tuning includes an underbody panel. A harmonious balance of space and proportions, fine materials and processing of the highest quality: The interior of the A5 models rests in the culture of the Audi brand. Now he is even more elegant - with a new steering wheel, available with a flattened rim, with new steering column levers and narrow chrome trim on the controls. The seat heating and ventilation options are each directly operated via a switch in three stages. The ignition key, the selector lever of automatic transmissions, the key of the optional Audi drive select driving dynamics system and the operation of highly efficient working air conditioning and multifunction steering wheel also experienced changes. The displays are lit throughout knows now. The aperture of the instrument cluster and center console have a new coat, the linen and decorative inserts - in aluminum Trigon and the types of wood ash burl walnut wood and naturel - are selected again. Almost all interior colors are new, the Coupe and the Sportback Fine Nappa leather replaced the variety Valcona, others as well as the armrests with leather. Upon request, the A5 Sportback is now also available as a five seater. Another attractive option is the S line sports package. It bathes the interior in black and refine it to make applications. A sport suspension that lowers the body by 10 millimeters lower, and 18-inch wheels complete the package.Friends of the Audi exclusive program in particular will find many more individualization proposals, including the stylishly assembled Audi exclusive line, with two-tone upholstery. the A5 family sets new standards for efficiency and sportiness. All engines are turbocharged direct injection of high pulling power, even the entry-level assembly braces 320 Nm. The start-stop system and the recovery system for all motors are serial - no other manufacturer is going on so consistently. The program includes three petrol and four TDI, while CO2 emissions have fallen by up to 22 percent. Even the reworked from the ground on 1.8 TFSI has the full expertise of the brand. In controlling the valves and their hubs, the innovative thermal management, with the injection system, the turbocharger and the integration of the exhaust manifold, he presents groundbreaking innovations. The A5 coupe, the high-end four-cylinder consumes an average of just 5.7 liters per 100 km (134 grams of CO2 per km) - the best in its class and 21 percent less than before. With 125 kW (170 hp) drives, the 1.8 TFSI in the A5 powerful. The 2.0 TFSI develops 155 kW as before (211 hp). New to the Audi A5 is the 3.0 TFSI, a V6 with compressor supercharging, which delivers 200 kW (272 hp). The diesel engines impressed with their efficiency, the four-cylinder modified in many areas. The 2.0 TDI in the version with manual gearbox and an output of 130 kW (177 hp), is content in the A5 Coupé to 100 km with an average of 4.7 liters per 100 km - equivalent of 122 grams of CO2 per km, and a milestone in the coupe segment. for each engine, Audi offers the ideal power transmission. For the models with front-wheel drive are a manual six-speed transmission and the continuously variable multitronic ready. The quattro versions have a manual gearbox or the lightning-fast-shifting seven-speed S tronic on board. All transmissions are characterized by easy and precise operation, high efficiency and wide spread - the long translation in the upper gears reduces consumption. With permanent four-wheel drive Quattro A5-family uses in connection with the S tronic transmission - the crown-gear center differential with torque vectoring. In normal driving, the engine powers the mechanical component derives mainly to the rear wheels. If necessary, there it spread quickly and uniformly to - up to 70 percent can flow to the front, a maximum of 85 percent to the rear axle. The torque vectoring makes the handling of small braking interventions targeted more precisely. For all quattro versions, the sport differential is available as a supplement - with the A5, it goes with maximum precision and high traction. The sport differential divides the torque as needed between the rear wheels running on, for it uses two overlapping steps, which are connected via multi-plate clutches. The A5 models set the standard for sporty dynamics, ride comfort and refined driving safety. Most components of the five-link front and trapezoidal-link rear axle are made ​​of aluminum. The bearing of the rear-axle trailing and damper settings have also been redesigned - the handling is more precise and comfort become even better. When the A5 variants with front-wheel drive is the stabilization system ESP with electronic differential lock series. With dynamic pace, it makes the car brake by minimal intervention at the inner front wheel even more agile. The big brakes - very slow and can be dosed excellent - with many variants internally ventilated. 17-inch wheels with 225/50 tires are standard series, the radio program goes up to size 20 inches with 265/30 series tires, including four new wheel designs. Among the high-end features in the series include the driving dynamics system Audi drive select. The basic package, it draws on the power assistance, the accelerator pedal characteristic curve, the switching points of the automatic climate control and on. The driver can set a button in the cockpit, whether these components in the "comfort" mode, "auto", "dynamic" or "efficiency" should work. The latter helps the A5 to move more efficiently. If a navigation system on board, is the level "individual" to which the driver can configure itself in many areas. 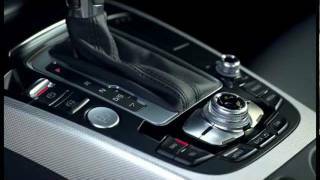 On request, Audi drive select can be combined with other components. These are the sports suspension with shock absorber control, the sport differential and the steering dynamics, their translation varies depending on the speed driven continuously by almost 100 percent. A series of innovation-in the A5 model line is the electromechanical power steering - an electric motor that generates support to match the pace. The electro-mechanical power steering is translated directly speaks spontaneously and provides precise road feel, when braking on slippery surfaces on one side it supports the driver with minor surgery. The system reduces fuel consumption per 100 km up to 0.3 liters, respectively, by up to 7 g / km CO2, because it takes no energy when driving straight ahead. The assistance systems in the Audi A5 series use different technologies to make driving even more poised to make some of them are refined with new features. Standard equipment includes the new driver information system with interval recommendation - it can be seen from the steering movements and of other parameters, when the driver is tired, and warned him accordingly. The Audi side assist helps the driver change lanes by monitoring the area behind the car by radar. The new Audi A5 in the active lane assist helps him to stay in lane: A camera detects the lines on the roadway, if necessary, the system corrects the electromechanical steering slightly. The adaptive cruise control radar useless to keep on the A5 at a constant distance to the vehicle ahead. At speeds below 30 km / h, it initiates an emergency braking if a collision is imminent. The infotainment systems present in the A5 is intensively developed. Audi fitted as standard in all variants of the series, a CD radio with eight speakers. The optional top unit is the MMI navigation plus with a large hard drive, seven-inch color display, 3D display and DVD player. Your operator terminal has been refined - the number of keys went eight solid back four, the volume control was a joystick cap for easy track selection. Further fine-tuning affects the voice control system and digital radio reception. As an additional option, the Bluetooth car phone is available online. Under the heading Audi attractive services connect it brings on board the A5 - from the POI search via Google on navigation with Google Earth images to wireless hotspot. About him, the passenger to surf freely on the Internet with their mobile devices and email. The Audi traffic information online, another service to tell the driver high and precise barometer of the load on the selected route, much better known than the TMC standard. To use these features, the driver only needs a data-enabled SIM card. 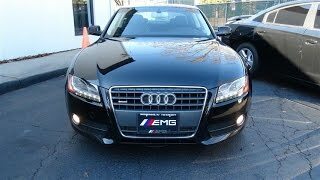 Despite the extensive appreciation of the series, Audi elevates the prices only modestly. The A5 Coupe 2.0 TFSI about the extra price is 200 €. The entry level model, the Audi A5 Sportback 1.8 TFSI costs, € 33 350.